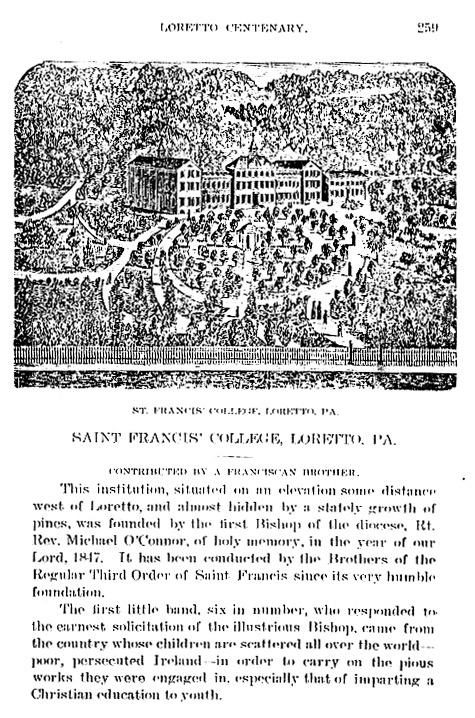 ST. FRANCIS' COLLEGE, LORETTO, PA.
SAINT FRANCIS' COLLEGE, LORETTO. PA. CONTRIBUTED BY A FRANCISCAN BROTHER. 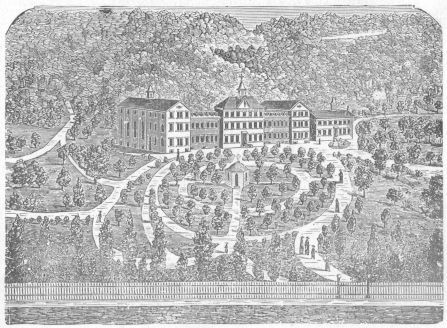 This institution, situated on an elevation some distance west of Loretto, and almost hidden by a stately growth of pines, was founded by the first Bishop of the diocese, Rt. Rev. Michael O'Conner, of holy memory, in the year of our Lord, 1847. It has been conducted by the Brothers of the Regular Third Order of Saint Francis since its very humble foundation. The first little band, six in number, who responded to the earnest solicitation of the illustrious Bishop, came from the country whose children are scattered all over the world -- poor, persecuted Ireland -- in order to carry on the pious works they were engaged in, especially that of imparting a Christian education to youth.